More Highways: The Cause or Cure of Increased Traffic Congestion? It may sound counter-intuitive, but widening highways often makes congestion worse in the long run. Why does this happen? Some experts have compared the phenomenon (often called “induced demand”) to loosening your belt to cope with weight gain. Or, think of trying to dig a ditch through a swamp ― water pours in from the surrounding land much like traffic pouring into a new highway from other congested or slower streets. Drivers are attracted to new or widened highways because they are initially free from traffic and often have higher speed limits than surrounding roads. The initially uncongested roadway can also lure new drivers -- people who were not making the trip, or who were taking public transit, carpool riders and people who were biking or walking. Eventually, so many new drivers flock to the road that the new lanes are filled with traffic congestion. Over time, new highways can also encourage longer and longer driving trips. As people live farther away from places for work, shopping and recreation, they spend more time in their cars and congestion becomes even worse. The added traffic spills over from the widened road and clogs streets on either end of the widening, where the amount of road capacity has stayed the same. This can create pressure to widen more roads, creating a never-ending cycle of congestion and road building. Research has shown that traffic congestion comes quickly to new highways, within just a couple of years of adding new lanes. Studies have shown that in less than three years, new drivers fill 10-50% of the new capacity (the number of cars that can travel on the roadway without causing congestion). Over the long term, the new lanes will be half to completely filled to capacity. The table below shows the results of seven studies that researched how congestion changed over time after new highway lanes were added. 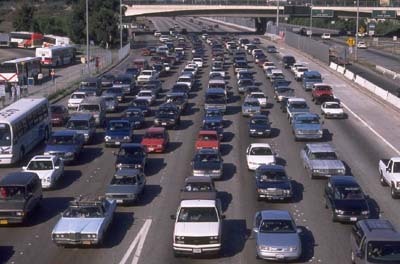 The Sierra Club reviews major research on congestion and road widening. The Tri-State Transportation Campaign has a bibliography with dozens of studies on congestion and road widening.